If all the positions were cut back in 2011-2012, then we could estimate there are about 4,211 civilian jobs associated with military installations in southern Nevada. 4,211 employees multiplied by the average salary or wages of $50,000 comes out to $210,550,000 annually. If we shave 20% of the total then we’d calculate a loss of $42,110,000 to the regional economy of southern Nevada. It’s at this point where the square peg of ideological purity meets the round hole of economic reality. Impossible Thing Two: “Every dollar borrowed by government is a dollar that is not being invested in our private sector economy.” This is an articulation of the Crowd Out Theory — this makes some sense IF and ONLY IF interest rates are HIGH. Even then it’s a bit sketchy because some government revenues are invested in research, development, business subsidies, commercial ventures, and the like. Dare we venture into the real world and look at corporate borrowing costs? If the Crowd Out Theory is correct, and government borrowing is making corporate borrowing more expensive, then what do we make of the following chart? 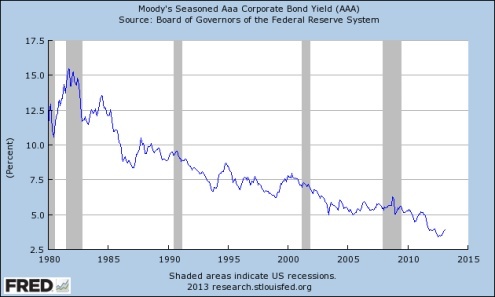 Moody’s forecast shows top quality corporate bonds paying about 4.01% interest through August 2013. As of July, 2000 corporations were paying 7.67% interest. [FRB H15] Thus much for government borrowing crowding out corporate borrowing. Impossible Thing Three: “Government can’t create jobs.” When pressed about the relationship between teachers, firefighters, police officers, social workers, and “government” the answer from right wing ideologues is often punctuated by stammers — or pontifications about how public employees are Piggies At the Public Trough. A decision must be made at this juncture: Does government not create jobs, or is it that government creates too many “good” jobs? Caution must be taken with charts purporting to “prove” government employees are making “too much money” in comparison to the private sector, especially when educational and expertise requirements are taken into consideration. Additionally, even the AEI is moved to report that workers moving from public to private sector employment are more likely to take a cut in pay. However, this isn’t the core of the issue. Government does create jobs, and in the private sector. 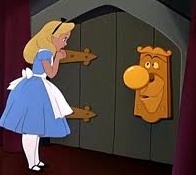 “But, but, but,” stammers our hypothetical ideologue, “Those aren’t REAL jobs. Permanent Jobs.” Ask any construction contractor and the individual will tell you the obvious: No construction job is permanent. When the highway is finished the job runs out and it’s time to bid for another contract. Since we have a lovely backlog of clean water, sewage treatment, bridge building, and transportation related projects we’re fobbing off on our descendants, wouldn’t it be a nice “job creating” thing if we paid some of this bill ourselves and at least made a head start on the payments? 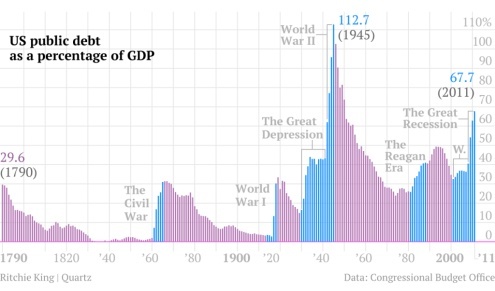 In the wake of the Great Recession and wars in Iraq and Afghanistan, we’re now looking at a 67.7 ratio; [Atlantic] but then Germany’s public debt is at 80.6, Canada’s is at 87.4, Italy’s is 120.1. [Atlantic] The average in the Eurozone is about 82.5. The trick isn’t to “pay off the national debt” because who would want their long term Treasury notes paid off before collecting all the interest? The U.S., as noted previously, doesn’t have creditors — it has Investors, and as of right now the 30 year U.S. note is paying a rather measly 3.15% interest rate. The ten year notes are only paying 1.95%, and the 20 year notes will earn an investor 2.77%. [TreasuryYieldCurve] If we aren’t obliged to pay higher interest rates to people who are investing in our national notes, then why should anyone believe that The Debt is a terrifying thing? Impossible Thing Six: “Federal Spending hurts our economy.” Now, we’re back to Nellis AFB in southern Nevada, or to northern Virginia — home to thousands of federal employees, or to Youngstown, Ohio with its TechBelt Initiative. What happens in places like Las Vegas and surrounds when $42 million is removed from the local economy in a year? As repeated ad nauseam herein, “government spending” doesn’t fall into a black hole. Salaries and wages are spent in the local economy, for everything from apples to zoology textbooks. Those unsure of the importance of federal spending in local economies have only to look at the various renditions of grief on display when the Department of Defense seeks to close a base. Once more, with great feeling — the formula for both aggregate demand and for the calculation of the GDP assumes government spending at national, state, and local levels. GDP= C+I+G (for government) + (X-M). What is truly alarming is the capacity of members of Congress to believe all six of these impossible things before breakfast.